After twenty years away, Kerry O’Hearn, thirty-eight, leaves her high-pressure career as a defense attorney in Portland, Oregon, and returns to her small hometown in the Willamette Valley to join her brother’s law firm. Kerry’s move is motivated by what is best for her three daughters: Shay, almost thirteen; Chloé, eleven, and Ella, two. Kerry may have found professional success, but her love life is another story. Twice she has fallen for a cop, and twice she has been left to be a single mother with her daughters’ fathers largely absent from their children’s lives. Returning home will mean that her girls have their grandfather and their uncle to make up for their missing fathers, and small-town life is certainly more economical than life in the city. Chloé and Ella are happy to be where their mother is. Now if only Shay can find her place in their new home, Kerry will accept that she made the right choice. When the harsh reality of a cop’s life in Portland became more than forty-year-old Alex Walker wanted to deal with any longer, he carefully chose the small town of Newberry, Oregon, as his new home. Two months into his job as Newberry’s newest police detective, he is enjoying the slower pace. Then, of all the courtrooms in all the world, Kerry O’Hearn had to show up winning another case in Newberry. Alex has never forgotten Kerry or the dismay he felt when her skills as a defense attorney torpedoed a case on which he had worked diligently. He is not at all happy to learn that she is living in his newly adopted hometown, but he finds her just as fascinating as ever. Neither Alex nor Kerry is looking for romance, and their history indicates that they are far from an ideal match. But as Alex begins working with Shay at the community center where he coaches boxing, helping her to develop confidence and handle the mean girls who are bullying her, Kerry and Alex are thrown into each other’s company. The spark of attraction gains power. Kerry resists the idea of the two of them as a couple longer than Alex does, but Alex’s steadfastness and his rapport with her daughters make him difficult to resist. Can Alex persuade Kerry that the third time may be her chance for the HEA that has eluded her? 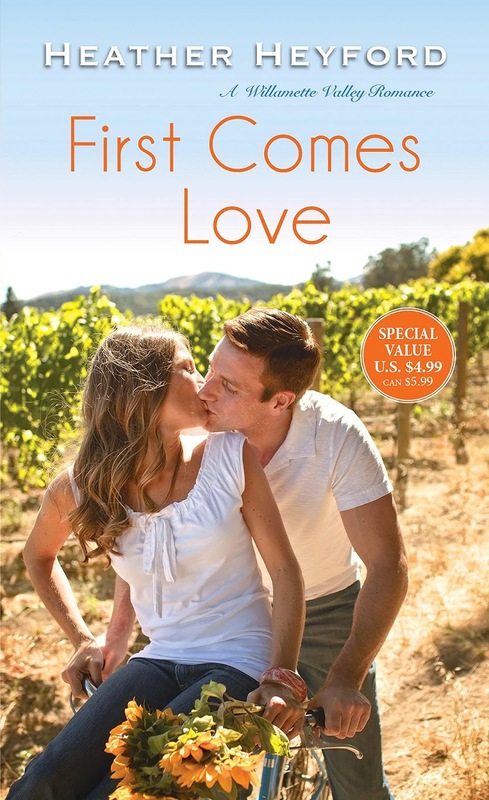 Heyford’s second novel in her Willamette Valley series is a sweet story, rich in family relationships, small-town comfort, and a romance between two deserving people old enough and with enough scars to have lost their faith in romantic love. If you don’t like kids in your romance fiction, this one is not for you. Kerry’s three daughters play important roles, and each girl—even toddler Ella--is a definite individual with a distinct personality and a contribution to the story. Additionally, Alex becomes involved in the lives of two young brothers, Tyler and Travis Pelletier, whose experience with their neglectful parents mirrors Alex’s own childhood. They also serve as a reminder that affluence is not necessarily protection from neglect. Some readers may see this novel as a variation of The Brady Bunch and a story that gives the romance too little attention. Others will delight in the heartwarming tale and the satisfyingly sentimental conclusion. I belong to the latter group. Even though this book follows The Sweet Spot (February 2018), it works well as a standalone. I liked First Comes Love so much that I checked out the first book and added the third one, Right All Along, a reunion story that will be released September 25, to my want-to-read list. If heartwarming is your style, I think you will like it too. Thanks for the review. Sounds like a sderies I might enjoy.